Mythical's win at the $15,000 USHJA International Hunter Derby at Traders Point boosted Kelley Farmer to over $1 million mark in lifetime hunter earinings. On Aug. 10 at the Traders Point Hunt horse show, Kelley Farmer became the first rider to claim $1 million in lifetime hunter earnings, thanks largely to money earned in the USHJA International Hunter Derby series. At Traders Point, she topped the $15,000 USHJA International Hunter Derby on Mythical for Ken and Selma Garber and Larry Glefke. She also earned second on On Q and seventh on Skorekeeper for Larry Glefke and Quail Run Partners. As of Aug. 13, her lifetime earnings total $1,011,456. The USHJA Rider Lifetime Money Won leaderboard tracks money earned by professional riders beginning Dec. 1, 2005. Farmer’s partner at Lane Change Farm, Larry Glefke, had been keeping track of her winnings in anticipation of the award. 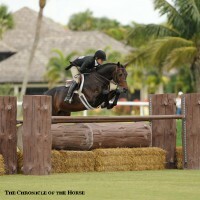 Farmer will compete in the USHJA International Hunter Derby Championships this week at the Kentucky Horse Park.